1. In mixing bowl, place all ingredients except for pork chops. 2. In heavy, resealable plastic bag, place marinade along with pork chops and refrigerate 6 to 8 hours, turning bag over a few times. 3. Remove pork chops from marinade and discard it. 4. 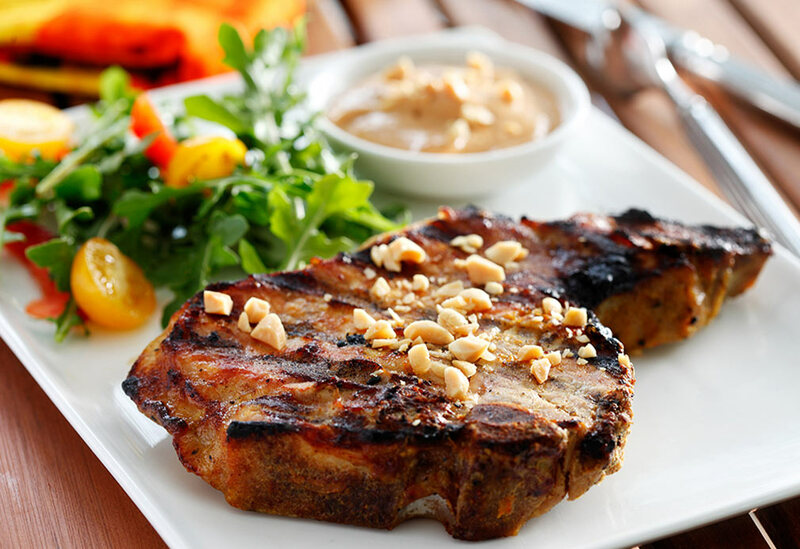 Place on pork chops on medium-hot, lightly oiled grill and barbecue for 12 to 14 minutes (6 to 7 minutes per side), depending on desired doneness. 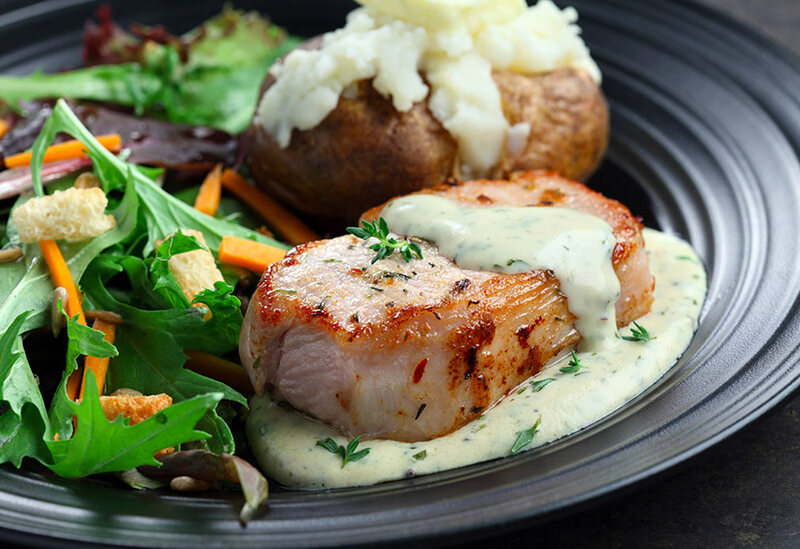 If pork chops are thinner than 3/4 inch (2 cm), only cook 5 to 6 minutes per side. Serve with peanut satay sauce on side (recipe below). Tip: As an alternative, make appetizer kabobs by threading strips of pork on bamboo skewers. 5. In saucepan, heat canola oil over medium heat. 6. Add ginger and curry paste and sauté until fragrant, about 1 minute. 7. Stir in peanut butter, water, brown sugar and soy sauce. Mix until well combined. 8. Add lime juice and coconut milk. Mix until smooth. 9. 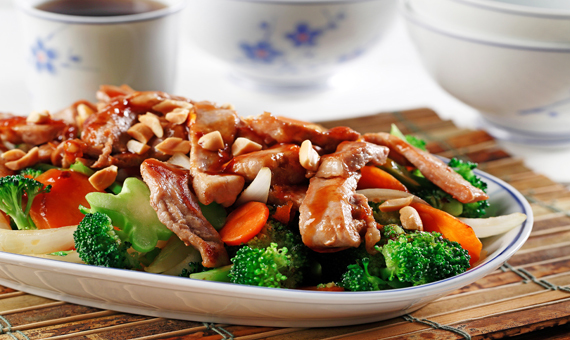 In bowl, place sauce and garnish with chopped peanuts. 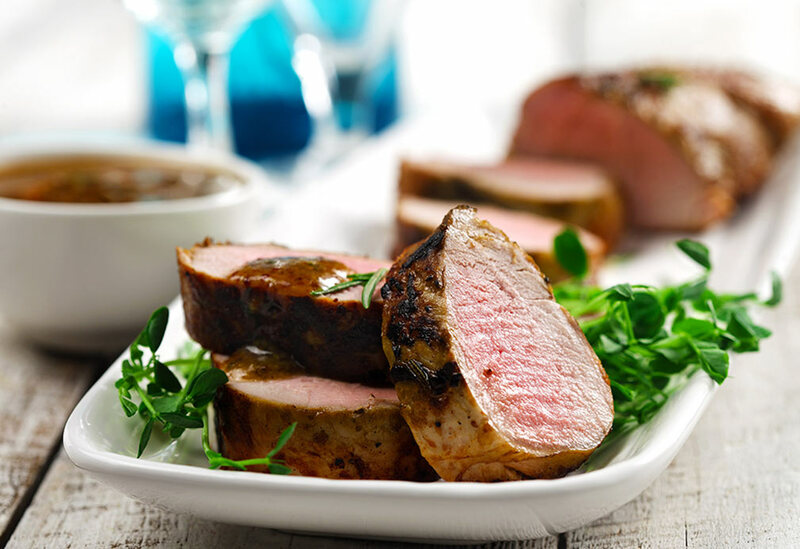 Pork tenderloin is lean, yet tender and flavorful. Its long, narrow shape allows it to cook quickly, making it a great choice for fast, weeknight meals. Searing the meat on the stove-top first in a drizzle of canola oil adds flavor by browning the exterior; it then finishes cooking quickly in the oven. A simple, five-ingredient marinade does double duty - after infusing the meat its simmered into a sweet, savory sauce to serve alongside the roasted pork.